Hello and happy Thursday! We are showcasing Stampavie stamps for the next couple of weeks on the ABC Toys and Crafts Design Team Blog~LOVE their adorable images! 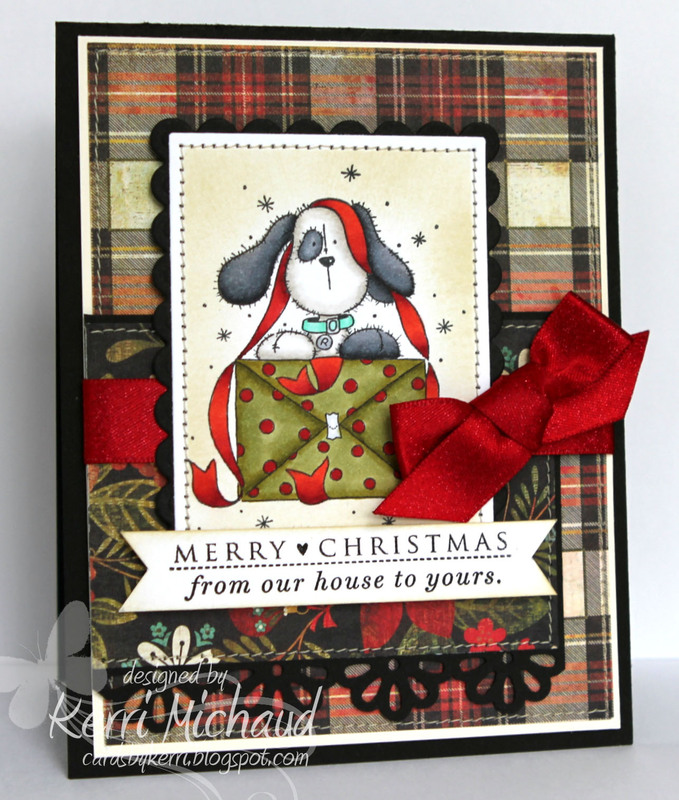 For my card today I used this cutie Ruffles~A Present For You by Helz Cuppleditch. I stamped him with Memento Tuxedo Black Ink and colored him with Copics. I cut him out with Rectangle Nestabilities and sponged around him with Ranger Antique Linen Distress Ink. The dp I used is Basic Grey Jovial. I added a border that I punched with the Martha Stewart Daisy Border Punch. I added some sparkly red ribbon, some stitching, and a PTI sentiment (Love Lives Here Holiday) and called it complete! All store items are marked 10% off Suggested retail. Order $55.00 or more and receive Free Shipping in the USA. Clear Stamps *Sets (over $12.00) ship FREE in the USA. 23% off all INK products including Copic Markers until October 31st, 2011. 40% off all KI Memories Clear Stamps until gone. Thanks for stopping by! I have been working all week on some wedding place cards and favors for a bridal open house that my bff is hosting at the club where she is the event coordinator. I just finished tonight so I haven't had a chance to take pictures, but hopefully I'll get them back after the event so I can show you:) Have a wonderful day! Oh this is a cutie Kerri I love the plaid background! What a great card Kerri! Wonderful papers and a cute image. What a wonderful card Kerri. So cute Kerri!! Love the sweet image, your coloring and the papers you chose!! S stinkin adorable. Love the paper and rich colors. S orry I havent been by lately. catching up today hopefully. That is one of my favorite Christmas paper pads, and you've combined the patterns perfectly, but best part is your coloring on this adorable image, wow! !